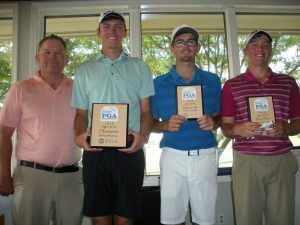 Great play ing in the Rocky Mountain Section PGA National Qualifier by Paul Weyland Golf student Jake Slocum. In the first round Jake had some putting issues but managed to post a 2 under par 70. That put him 5 back of Carson Barry, incoming freshman on the Oregon State Men’s Golf team, and 4 back of Sam Tidd, incoming freshman on the Oklahoma Men’s Golf team. On day two, in windy conditions, Jake shot the low round of the day posting a 7 under par 65 for a two day total of 9 under par. That put Jake in a sudden death playoff with Tidd for the second qualifying spot. Tidd won on the 3rd playoff hole with a birdie to earn his spot with Barry. Jake was very disappointed he didn’t qualify, but he proved to himself that when he needed to post a number to give himself a chance in a qualifier he could do it. Very proud of Jake!